Paint a tree on to the paper with brown paint. Cut out lots of leaves from the green paper. On each leaf draw a different member of your family. Glue your leaves to the tree. 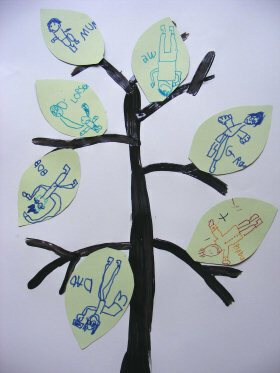 Older children could try and draw their tree branches and stick their leaves in such a way as to show the generations. Make a 3D tree. Find a branch/ twig and pop it into a vase or pot. On the back of each leaf write one reason why you love that member of your family. Punch a hole in the top of each leaf and tie them to the tree.